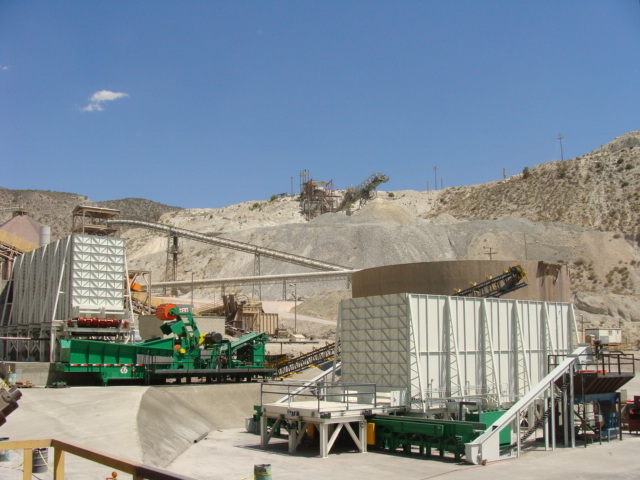 Rawlings has completed one of the first wood waste recovery systems to introduce biomass as fuel to heat cement kilns at Mitsubishi Cement in Lucerne Valley California. The system is capable of processing and storing up to 350 Tons of premium biomass fuel wood waste to be burned along with coal to reduce the amount of greenhouse emissions. The biomass will replace part of the annual tons of coal the plant would otherwise have used. The Rawlings Electric portable wood hog is a rugged, high performance hog that can reduce various types and sizes of contaminated wood waste to biomass fuel. Once the wood waste has been processed through the hog, the metal is removed by an overhead self cleaning magnet and then conveyed to a walking floor stoker storage system. To ensure the optimal size end product the wood waste is then processed over two vibrating finger screens and then transferred to the kilns via a blower system. Rawlings designed, manufactured, and installed this system and has an ongoing consultant relationship with plant management and personnel. Rawlings Waste Wood grinding systems come in all shapes and sizes, from simple stand-alone vertical hogs for saw and paper mills, to complete multi-dimensional custom horizontal hog systems for processing facilities that incorporate various combinations of primary shredders, screens, conveyors, magnetic separators, and secondary grinders to assure specific product size. We invite you to inquire about any of the projects that we have completed, and can provide you with full details and a complete customer contact list.